In-Tents: First Tent Blog Ever! Ok, I haven't exactly conducted research to definitively claim the "first tent blog ever", but I'm going with it. 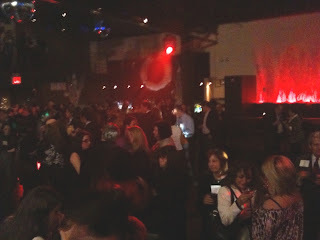 This is my first post for "In-Tents" a Stamford Tent & Event Services blog. I plan on providing informative, interesting stories, news and ideas on a fairly regular basis. Most related to tenting, others related to the events industry as a whole, and still others that have nothing to do with our industry but that I've found interesting or amusing. I also plan to have our President, Steve Frost contribute when I can tie him down for a few minutes (easier said than done!). Other members of our senior managment team will also chime in from time to time; Tim Frost, VP; Brian Rieke, Director of Operations and perhaps our CFO, Barry Bosworth who will tell you how I spend way too much money. Oh yes, good stuff. 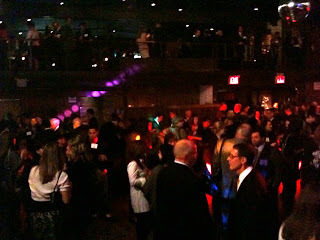 I attended the ISES (International Special Events Society) "Rock The Holidays" Party last night at the Highline Ballroom in Manhattan. I had a blast, met some very interesting and friendly people who I look forward to speaking with and seeing again soon. I'll leave you with two relatively non descript pictures from the event (courtesy of my cell phone). Good thing I'm not a photographer by trade, that's for sure! Not the most awe-inspiring pictures you'll ever see, but pictures just the same.